Perfect weather for the Ride 100 London and strategic training resulted in my feeling ready to go and on for a good time. Great camaraderie in the holding chutes at the Olympic Park and excellent organisation starting the 30,000 cyclists between 0600-0900. I had an 0803 start and had anticipated completing the 160k in 7-7.5 hours. Support en route was co-ordinated by Peter with precision due to modern technology! I even had a friend monitoring progress from Cape Town! First stop was 10 mins ahead of schedule, coffee waiting (essential!). Some 2k down the road thousands of cyclists at a complete standstill. A major accident entailing the Air Ambulance and ground ambulances in attendance ...but access very difficult on the narrow roads in Surrey, resulting in a 2 hour delay going nowhere! Dunkirk spirit prevailed, and almost 100% understanding. One resident (there is always one!) grumbled "well, I knew I couldn't drive today but I did think I would be able to walk!!!" It was a wake up call that nothing is more important than saving lives - almost everybody taking part is raising funds for charity. It certainly made my fund raising for Medic One come clearly into perspective and the wonderful work you all do. By the time I got to the turning to Leith Hill (Lethal Hill!) it had been closed off as the event was running so late (I wasn't too unhappy about it!) But I did all the other hills with no walking and finally raced down the Mall towards Buckingham Palace with a final time of 8 hours and 57 secs!!! I felt absolutely fine and am on for riding again next year! I would like to thank everyone who donated ... it is the inspiration that keeps me going. To date, I have raised £2,285 and with Gift Aid £2,767.50 and donations are still coming in. I hope this may not only make a significant difference to Medic One to enable the continuation of providing this wonderful service to the public, but also to encourage others younger and fitter than me to make a meaningful contribution to such a worthwhile cause. 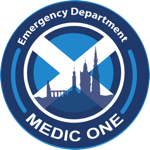 The Medic One trust would like to congratulate Janie for an amazing effort and thank everyone who kindly donated to Medic One. Older PostPain of the Soul?